When you eat like a nutritarian "salad is the main dish". I eat salad at least once or twice every day, and I have to keep coming up with new salad recipes, or I get bored! 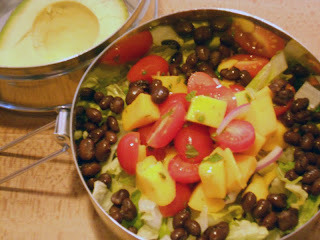 Here's another healthy, nutritarian-style salad I've been enjoying lately: Mango & Grape Tomato Salad. The flavors here are bright and sweet, and the recipe is simple. For the dressing, whisk together 1/2 cup mango juice (I used a mango-peach blend with no added sugar, but I bet you could easily put chopped mango into a blender with water and strain to make your own mango juice), 1 tablespoon fresh lemon juice, 2 tablespoons minced fresh mint, a pinch of clove and a pinch of coriander. For the salad, cut a pint of grape tomatoes in half, dice two ripe mangoes (I like Ataulfo mangoes, they're so creamy), slice or dice 1/4 of a small red onion, and toss with the dressing. Serve on a bed of lettuce with black beans and diced avocado. For my lunch I wrapped my avocado on the side to dice at lunchtime, so it stayed fresh. This looks absolutely delectable!!! Plus black beans make for excellent protein. Our mango tree is starting to bear fruit. Going to keep this recipe in mind for when those mangoes start to drop! Wow this looks so tasty!! here's a fun rap video about making healthy food choices! Just made this and served with vegan muffins - so good!! Thank you! I just made this...sooooo good! Thank you! I totally agree with you that salad is very important for a nutritious diet. I found new recipes for salads at Wholesale Food. I hope this will be of some help to you. Keep up the good work. I have actually tried a salad very simlar to this one. It tasted amazing! Raw food has always remained best nutrient food. Looks delicious! I can't get enough of black beans in salads. I could eat them for almost every meal! I cannot wait to try this out! It looks great. I like adding fruit with my salads because I feel like it really brings out the other flavors. I agree black beans are a smart add for the protein aspect.